You can go to any grocery store and find over-the-counter whitening treatment. You’ve most likely seen commercials or heard radio advertisements for these supposed “great” whitening products. 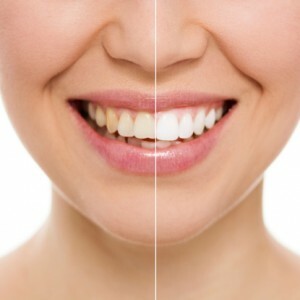 Safety becomes a major issue when discussing these whitening treatments. Unlike professional teeth whitening where the dentist is well aware of the chemicals and whitening agents that compose in-office whitening, nobody really knows what’s inside of over-the-counter treatment. The results aren’t that great either. Tooth sensitivity and oral sores are most commonly experienced by patients that use them. On the flip side, we have in-office treatment. The first benefit right-off-the-bat is the fact that the procedure is overseen by a licensed dental professional. Our in-office treatment can get your teeth looking up to several shades brighter and can be completed in just one office visit. You can’t get those type of results with over-the-counter brands. Not only do they not work fast enough, but the results are mixed and most often not even worth it in the end. There’s simply no better way to get your teeth white than coming to our office and having our dental team get to work on making your smile look amazing. There’s so much to learn about whitening treatment that we can’t fit it all in this blog post. You can, however, speak with our staff and make an appointment. Don’t’ bother with over-the-counter brands with questionable chemicals. In-office treatment is great for all patients and, most importantly, is safe. We welcome all residents scattered throughout the Toledo, OH area to visit us.